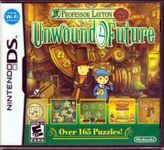 Professor Layton and his apprentice, Luke, receive a confounding letter from Luke 10 years in the future. But the message inside is even more troubling: London of the future is in disarray, and the only person who can help set things right is Professor Layton. * More than 165 new puzzles weave seamlessly into the storyline. Players will be challenged with fun, brain-teasing logic puzzles and riddles, and even new types of puzzles. * This game features significantly more hand-drawn animated sequences and voice acting than the previous installment of the series. * Players who are still stumped with a puzzle after three subtle hints can select the new superhint option to point them toward a solution. * As with previous incarnations of the franchise, weekly downloadable puzzles will be available after launch for a limited time.